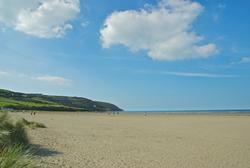 Poppit Sands Beach, North Pembrokeshire. The glorious beaches of Pembrokeshire are listed in clockwise order starting in the south east of the county at Amroth and ending in the north west at Poppit Sands. They are listed in three sections: south coast beaches, west coast beaches, and this section, the north west coast. Only the main beaches have been listed. There are many other small coves which can only be reached from Coast footpath. Many of the beaches have been awarded European BLUE FLAG status. This is awarded for water quality, beach cleanliness and facilities. The awards are made annually. Pembrokeshire County Council and The Pembrokeshire National Park Authority are encouraging visitors to make the most of public transport when visiting the beaches and coastline as congestion can be a problem in high season. Therefore, we have listed the the route number of the bus services for each beach. Full details of the route and bus operator can be found in the Getting around section of this website. This section comprises the beaches from St David’s Head to the border with Cardiganshire at the Teifi estuary. The coastline is far more rugged and dramatic along this stretch with smaller coves and beaches than in the southern part of the coastline. There are however two larger, popular stretches of sand in the north west. Pebbles and rock pools with sand at low water. To the west of the beach, the Coast path leads to the Blue Lagoon. This large pool was man made many years ago, when the headland was being quarried for slate. The whole area is now under the care of the National Trust. Car Park. Pubs cafe’s and shops at Croes goch or Porthgain. Nearest bus at Llanrhian Routes 342 and 411. A sand and rock beach which is reached by a steep path from the Coast Path. Nearest car parking at Abereiddy or Porthgain. A small sandy beach at the back of the harbour. Car parking, Pub restaurant and shops. The pub is the famous “Sloop Inn” which serves excellent food and the restaurant is the acclaimed “Shed” which has been featured in many foodie publications. The wife cooks whatever fish the husband catches. Nothing could be fresher! A small shingle beach. Very popular with divers due to clarity of water. Limited parking. Shop and pub at Mathry. A sand and shingle beach at the back of the harbour. Great place to watch the shipping activity in the harbour. Parking at back of the beach. Pub, cafe and shops. Train at Fishguard harbour. Car ferry from Rosslare in Ireland. A small sandy beach on the west side of Dinas Head. Views of Fishguard Harbour. It is a 1KM easy walk to Cwm yr Egwlys. Parking. Pub. Shops and cafe at Dinas Cross. A shingle and pebble beach on the east side of Dinas Head. Views across Newport bay. Pub cafe and shops at Dinas Cross. Parking. The ancient town of Newport has two beaches, the town or Parrog beach being nearest to town. The Parrog is a sand and pebble beach. There is a selection of shops, pubs, restaurants and cafe’s in Newport. Parking. A large sandy beach backed by dunes situated at the mouth of the Teifi Estuary. Very busy is high season. Due to its situation at the mouth of the river, bathing can be dangerous due to tidal and estuary conditions. Follow Lifeguard flags and warning signs.Good views across the estuary towards Cardigan Island. Bottle -nosed dolphins can sometimes be seen offshore. Large car park. Cafe. Other facilities can be found in the village of St.Dogmaels or the town of Cardigan. The Pembrokeshire Coastal Path starts (or finishes) at St.Dogmaels.